locomente...: Dude, World is too small!!! Dude, World is too small!!! Who said the world is too huge a place? I say that it is too small; so small that you end up knowing one or the other person wherever you go. You end up liking someone or the other on the very first meeting. You find out some similarities with your loved ones even in complete strangers. Some of their mannerisms never fail to strike a chord with you. You realize that people are people and you end up feeling connected with them. You think that the chapter of some people in your life is over and one fine day you meet them accidently. Satya this is a very beautiful poem on the prompt. 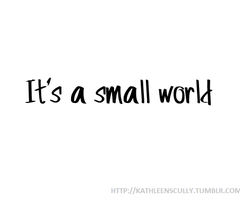 The world is indeed too small. "You may have hated them once or you may have never been friends. But, when you bump onto them after years, a wide smile would crack in your face." Your post just made me think. True that. It's queer how when we meet someone with whom we may have had grudges with before, we seem to forget them at that very moment. It's as though time has healed wounds and you just want to forget what happened before! Thanks for sharing! "You realize that people are people and you end up feeling connected with them." True ! Loved this post.